What do Dim Sum, Tacos, Har Gow and Salt Air Margarita have in common? They are the star dishes of China Poblano at the Cosmopolitan of Las Vegas where renowned chef José Andrés skillfully displays his culinary expertise. China Poblano offers both Chinese and Mexican dishes in an astonishingly well-combined Eastern-Latin atmosphere. Daily: 11:30 a.m. – 11:30 p.m. Lunch: Mon. – Fri. 11:30 a.m. – 3:30 p.m. Call the Cosmopolitan at 877.551.7776. If you are looking to try innovative cuisines, look no further than Chef José Andrés’ China Poblano. Listed in the Time Magazine’s 100 most influential people for 2012 and holder of several culinary and cultural awards, he is known as the master of the small plates and a virtuoso of the Spanish cuisine. The renowned chef is also an advocate on food-related issues and the frontliner of ThinkFoodGroup’s concept consulting and project development. With José Andrés culinary vision, you can enjoy delicious and healthy menu blends that are also appealing to the eye. The Cosmopolitan of Las Vegas is about the modern spirit of luxury and innovation and that is just what China Poblano represents, a surprising bridge between Eastern and Latin culinary adventures. The restaurant is a grand embodiment of the hottest global food trends with its interesting and innovative presentation of two colorful food cultures – China and Mexico – coming together in one table. Take China Poblano’s Twenty-Vegetable Fried Rice, for example. This star dish had been featured on The Food Network on The Best Thing I Ever Ate as recommended by pastry chef Johnny Luzzini. Not only that, viewers gushed as Chef Andres cooked up a storm at The Ellen DeGeneres Show and revealed the secret behind Twenty-Vegetable Fried Rice’s mouth-watering taste. You may check out its long list of ingredients and try it at home, follow the recipe here. China Poblano’s menu balancing on Chinese and Mexican dishes can truly convince food lovers to try out some traditional dishes carefully prepared with modern flavors. Chef Andres’ take on Pollo a la Parilla with grilled chicken, guacamole and green onions is prepared so deliciously you can’t help but take one more bite, and the fancy Love is in the Air Enchaladas, with ceviches containing heirloom tomatoes, sugar foam, and lime dressing, could probably be the start of your Love is In the Air foodie love affair. Also not to miss are the signature Carnitas – braised baby pork with spicy salsa – from the tacos selection. But before your mind spins with these Mexican selection, wait until you see their Chinese dishes – the Har Gow Dim Sum with pork belly, shrimp and broth, Rou Jia Mou Street Sandwich, Dan Dan Mian Noodles, Gan Pung Ji Chicken Wings, Siu Mai selections and numerous others all ready to take you to food heaven. For vegetarians and vegans, worry not, China Poblano can provide palatable dishes since the restaurant also offers vegetarian dishes at your request. Try their Hongos taco with mushrooms, rajas and homemade guacamole, or the Beijing Glass noodles with bean sprouts, Chinese cabbage and sesame dressing for delicious meals packed with health benefits. Of course, no meal is complete without a good cocktail selection so consider China Poblano’s Cocktail Experience for its combination of four special cocktails that fit every meal. Another must-try is their famous signature cocktail – The Salt Air Margarita – a unique blend between tequila blanco and salt air made to represent China Poblano’s distinct and avant-garde appeal. 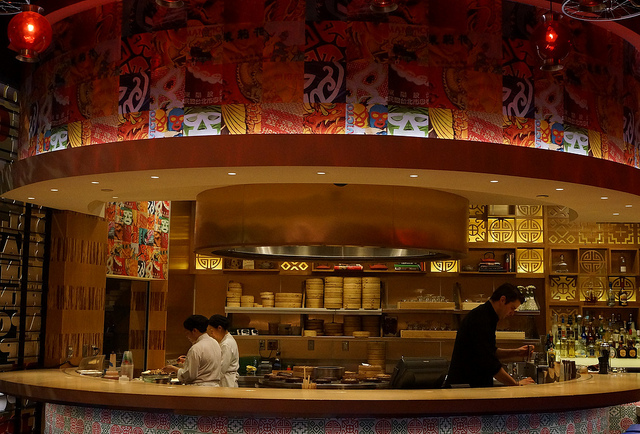 China Poblano is located at The Cosmopolitan of Las Vegas, 3708 S Las Vegas Blvd, Las Vegas. Find the location of the restaurant here. Guests who enjoy China Poblano’s distinctive dishes praise the restaurant’s servings of delicate flavors from both China and Mexico. A reviewer from Trip Advisor says the restaurant is a “great place to eat and affordable” while another says that “China Poblano is a crowd pleaser” China Poblano has almost a thousand reviews in TripAdvisor. With its good reviews, the restaurant received TripAdvisor’s “Certificate of Excellence.” The restaurant also has more than a thousand reviews in Yelp and got high ratings from both Yelp and TripAdvisor.